The Nigerian Navy has won the love of the Senate with the implementation of its 2017 budget allocation and more money will fall on them in 2018 and 2019. The Senate is satisfied with the way the Nigerian Navy spent its 2017 budget and it is willing to make provision for more fund for the the take-off of the Naval War College building in Cross River State. If it is not possible to allocate funds to the war college in the 2018 budget, the Senate will look at the 2019 budget. That was the promise the Senate made on Thursday to the Navy in Calabar, the capital of Cross River State. Senator Isah Misau is the Chairman of the Senate Committee on Navy and he was in Calabar with his colleagues on an over-sight function to Navy formations in Cross River. Misau said that their visit to Calabar was to appraise the performance of the 2017 budget and know how to allocate resources for the 2018 budget. In the interim, funds would be provided for the clearing and fencing of the land in order to secure the area for the project. 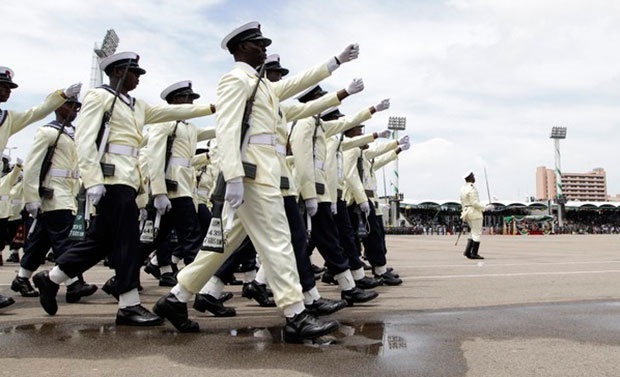 The committee members were conducted round the war college site, the Referral Hospital, the Nigerian Navy Ship-Victory yard and the Atimbo barracks by Rear Adm. Mathew Emuekpere, the Flag Officer Commanding Eastern Naval Command, Calabar. “The objective of our visit is based on the 2018 budget that came to us. Normally, before we pass the 2018 budget, we have to look at the performance of the 2017 budget so that we can make adequate provision for 2018. “The land for the war college is about 57 hectares plus another post housing area of about 70 hectares. We are going to capture something; even if it means clearing the place and fencing it. “Building in the Niger Delta area is very difficult; it is not something you can compare with the north. So, we are going to make adequate provision for the war college. “We will make provision for the clearing and fencing so that the navy can take adequate provision of the land so that if there are available resources they can start something. “If there is no much resources, then we will look at the 2019 budget for the actualisation of this project,’’ he said.